This beautiful villa to rent is situated on a stark slope that overlooks Lia, one of the most beautiful beaches in Mykonos. There are spectacular views that extend all the way to the bay of Kalafatis. This impressive example of Cycladic architecture is one a sister villa of Villa Lia 1, and on the same estate. The villas can be rented separately or together to accommodate larger parties. With its large outdoor spaces, the terraces and white-washed walls are softened by curved edges, and the emerald waters of the infinity swimming pool. Pergola-shaded areas are perfect for relaxing and dining outdoors, while enjoying panoramic views of the Aegean. The interior is contemporary and very true to elegant Cycladic design, with each space connecting through arched doorways. Although spacious and ultimately luxurious, the rooms have a cave-like feeling that is accentuated by the curved edges and lack of straight lines. The furnishing are in natural colours, mainly in soothing tones of beige, brown and grey. The spacious living room with floor-length windows, has high wooden ceilings and comfortable designer furniture. The dining area is stylish and minimal, and served by a fully equipped kitchen. The bedrooms are spacious and bright, with high windows that connect the interior to the outdoors. The décor is completed by a few antique pieces that grant a sophisticated touch. There is also a separate guest house with two bedrooms which is ideal for guests. Amenities include satellite TV, DVD, CD player, Wi-Fi access and air conditioning in all the bedrooms. Daily maid service included. Linen change twice a week. 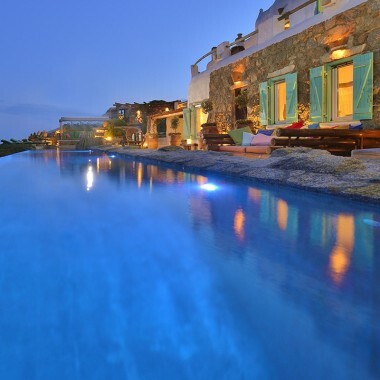 This luxury villa to rent is situated on a hillside overlooking Lia, one of the most beautiful beaches in Mykonos. The wonderful views extend all the way to the bay of Kalafatis. There is another villa, Villa Lia 1, on the same estate, and the two villas can be rented separately, or together, to accommodate larger parties.